The 5U dual-socket Dell T430 tower server is part of Dell's 13th generation PowerEdge line. It's loaded with the latest PowerEdge technology including Intel's Xeon E5-2600 v4 processors, an Intel C612 chipset, and DDR4 RAM clocking in at up to 2400MHz! 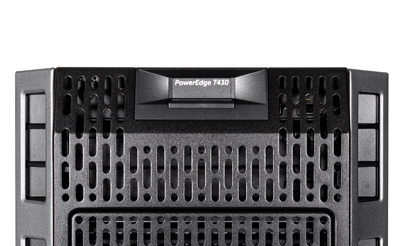 with the ability to be deployed as a rack or tower server, Dell's PowerEdge T430 server can effortlessly handle general office tasks including use as a web server, email server, communications server, print server, file server or in team collaboration. Intel's C612 chipset supports a maximum of two Intel Xeon E5-2600 v3 or E5-2600 v4 processors. Twelve DDR4 memory modules are supported in the two processor configuration and offer 15% more bandwidth than DDR3. Six PCIe slots provide options for external devices. Dell's iDRAC8 and OpenManage give Administrators easy to use management tools for onsite and remote access. Power is supplied by either a single 495W, 750W, or 1100W PSU. Dual PSUs provide redundancy. 12 memory slots are split between the two CPUs as follows; eight memory sockets for CPU 1, and four memory sockets for CPU 2. In a single processor configuration the T430 will support up to 256GB of memory. With two CPUs, 384GBs of memory is available using 32GB DDR4 registered DIMM (RDIMM) modules. Depending on your choice of processor, memory, and memory configuration, the system will support transfer rates of up to 2400MHZ. Only RDIMM memory modules are supported on this system. 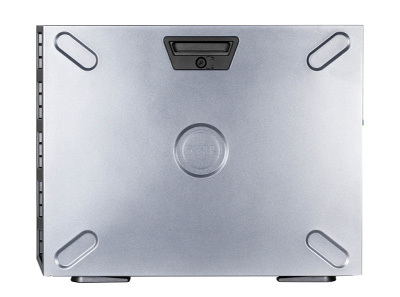 The built-in PERC S110 features limited software RAID support. Several optional PERC RAID controllers including Dell's PERC H730, H730P and H830, support the full range of RAID options to ensure your data is protected. There are 2 x PCIe 2.0 slots and 4 x PCIe 3.0 slots to support additional external devices. PCIe 3.0 delivers twice the data speeds compared to PCIe 2.0 technology. PCIe expansion slots can boost I/O performance, support high-end graphics cards, additional network connections, and solid state storage. Graphics on the system are handled by a Matrox G200 chip with iDRAC8 and 16 MB shared memory. For additional graphics support it can also be outfitted with either the single-width Q4000 or the double-width Q6000 GPU cards. GPU cards can only be installed on systems with redundant 1100W AC power supplies and must be of the same type. Dell is a leader in server management technology and offers multiple programs and licenses to achieve superb management efficiencies across the range of PowerEdge servers. Dell's Integrated Remote Access Controller, iDRAC8, comes standard and offers basic onsite and remote management features. Upgrading to iDRAC Enterprise with Lifecycle Controller enables additional tools for deployment, automatic updates, and remote monitoring of availability and system health via a mobile phone. iDRAC8 offers unparalleled agent-free capabilities, easy integrations, and anytime anywhere access that makes your IT department measurably more effective, while reducing overhead costs. The two-socket PowerEdge T430 provides powerful performance and reliability, with plenty of room for expansion. Featuring ultra-quiet acoustics, the T430 tower server is suitable for a front office deployment—even under full load. Intel's Xeon E5-2600 v4 processors provide world-class performance across a broad range of computing tasks. The PowerEdge T430 tower server performs brilliantly and delivers the compute power needed for, web, print, and file serving, mail serving and collaborative teamwork. It's a highly versatile server that can be deployed as a tower or rack mounted with an optional rail kit.